Not all EMDs are bad, some of them possess a legitimate non-spammy link. The EMD Update launched in September 2012 was the first step by Google to prevent poor quality sites from surpassing the legitimate ones. Exact match domain (EMD) is looked as a sort of spammy practice by some websites whose domain names matches exactly a search query that makes them rank higher in the SERPs. For example, an EMD might look something like “cheapflighttickets.com”, “bestmoviesforfree.com” and so on. Most of the times these EMDs even surpass the legitimate sites who actually should rank for the keywords. They manipulate the higher ranking keyword into their domain names and make themselves lucrative in the SERPs. When the first update was launched in 2012 in the reign of Matt Cutts, it mostly purified the Google’s SERPs in term of EMD prevention. Whenever an EMD update is released, the sites having quality content and non-spammy signals are expected to regain their higher rankings. What makes EMDs so vulnerable? The EMDs are seen as a sure sign of a spammy link if the domain name is exactly the same as a search term. Just think of the situation when you search for “cheap flight tickets” and in return, you get a top search result with a domain name like”cheapflighttickets.com”. You would open the link and might not find any cheap flight ticket at all. In fact, you might not find any flight tickets related content at all. EMDs can surpass the legitimate domain names with brand identity as the only signal. 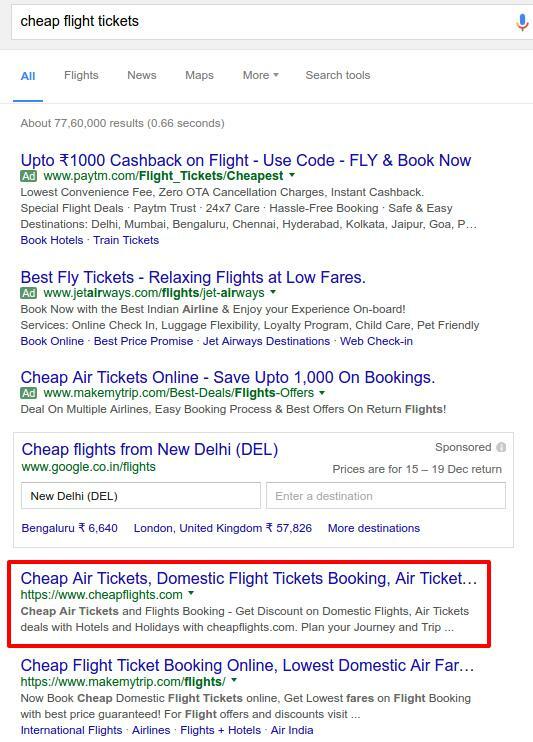 I am certain that if we ignore the Google-Adwords, makemytrip would not want a spammy link to rank higher in the Google’s SERPs. This screen shot is not real, though, it’s an edited version of the original Google’s SERPs where actually, a legitimate site ranks higher. I have edited this page to give an insight about how the legitimate links are badly hit from the EMDs. This is the case when bad EMDs are needed to be discouraged from the legitimate SERPs of legitimate search queries. Most of the times a searcher has to scroll almost below the fold to find a legitimate company providing the relevant cheap flight tickets for actual. It creates a serious disadvantage for the ones who uses their brand name in the domain and the only thing to rank higher for them is the brand name itself if we ignore the content SEO. Google has been keeping its eyes from a long time in this unfair advantage by the EMDs. The EMD update in 2012 was a proof of that. What is the current scenario of EMDs regulation in Google? The EMD update in 2012 by Google was an algorithm which was meant to reduce the amount of irrelevant, low quality and spammy exact match domains from its SERPs. No major trembles were seen after 2012 though. It was until the past few days when Search Engine Roundtable reported some interesting tweets by Gary lllyes which I found in a post on Searchenginewatch. The tweet has made and indication that Google might re-initiate it’s hunt for bad EMDs soon. Finally, not all the EMDs possess the bad links spam signals. Some of the EMDs like cheapflights.com that I have mentioned in my example above is actually a high profile domain. It has its ways to provide the legitimate solutions justifying its domain name with the relevancy of the search query. It posses a non-spammy operation. And that’s the thing which the sites with brand name domains need to worry about if their content marketing and SEO is not well enough. “there is no problem with EMDs. The problem is when It’s combined with other spam tactics”. 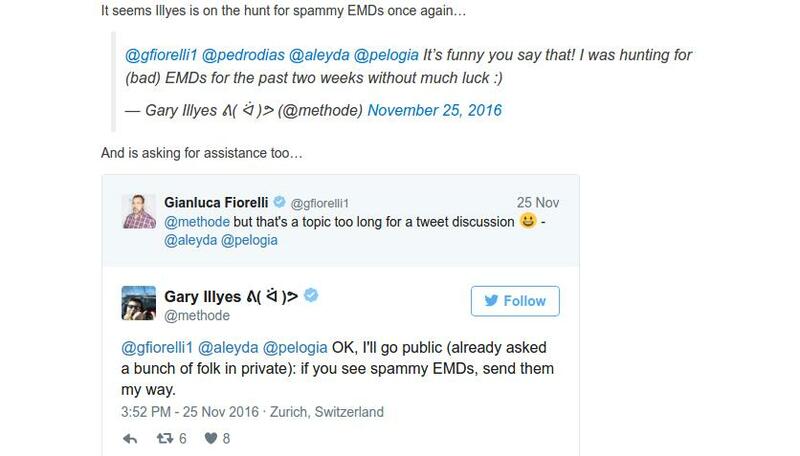 So, if you possess a site with spammy signals plus an EMD, then you need to worry as Google can anytime re-initiate its hunt for you. A better SEO for your site would be to avoid the EMD, or if you already have an EMD site then you need to check for the rogue signals ASAP.